This touching and impressive documentary recounts the experiences of this humble man, who, because he was a Bible Student (Jehovah's Witness) and objected to military service had to endure the brutal machinery of the Hitler regime in three concentration camps (Buchenwald, Niederhagen and Ravens-brück). This film includes original film material from the years 1896 to 1945. Total running time: 148 mins. The educational DVD contains not only the full documentary (61 mins.) and an abridged version of it (27 mins.) but also five films (between 8–15 mins.) 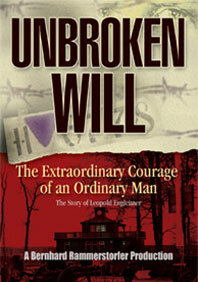 showing special events from 1999–2004 relating to Engleitner's awareness-raising as a survivor of Nazi persecution. The educational DVD features additional material (background information) and material for schools (multiple-choice quizzes, word searches, filling in the blanks) on the Holocaust in pdf format in English, German, Italian and Spanish. Teachers and pupils have the chance to make in-depth study of the Holocaust and the film material part of their lessons. The choice of languages and subtitles makes the DVD suitable for foreign language learning as well as for the hearing-impaired. "Brilliantly researched and produced to perfection, Rammerstorfer succeeds in telling the life story of a man whose memory spans the whole of the 20th century." "This film is an important archive and Leopold's story is compelling. What is so striking as the narrative progresses and Leopold tells us his story is that his face is full of peace in spite of the horrors of his terrible experience." If you want to place an order for the book, video or dvd educative "UNBROKEN WILL" or for the German version of the book "Nein statt Ja und Amen", please click here. Among more than 500 movies from 37 countries "UNBROKEN WILL" was chosen to be awarded the "Golden Bear" at the 31st Festival of Nations in Ebensee. "First Prize" at Film Contest "Upper Austria in Film 2003"
"First prize" and "best film" in Category A at the film competition "Upper Austria in Film 2003"